This seems to be the norm these days. I get home a little early in the day from work, just sit down to what I think will be a quiet hour or two, and then the garage door makes its ascent. What? It’s 2:00pm and my garage door creaks and groans against the old chain pulling it into the ceiling. And my guard goes up, the quiet dreams are literally sucked out the open window and I’m in another full-blown conversation. This isn’t as upsetting as I’m letting on. My oldest is in the last year of living at home full-time (at least that’s the plan), so I’m pleased with any moment we get together. She showed me who the next Bachelor will be, we exchanged a few comments about our day and she floated out of the room. I barely noticed. I thought about returning to my plan to rest a while, sit a while, be contemplative for a while, but instead, marched out to the kitchen, through on an apron and went all domestic on my household of six. It’s uncharacteristically cool for this time of year. Beginning of September in the Midwest won’t typically find you frantically pulling out sweaters and sweatshirts, and bare toes in sandals I’m not ready to put away quite yet, are a little on the shivery side. Knowing this change in temps was coming, I was prepared with everything I needed for my masterpiece, Beef Bourguignon. This recipe makes an appearance twice a year because it takes forever to make and soils piles of large stove top items. I love to cook, but love it even more when someone else does the cleaning up! 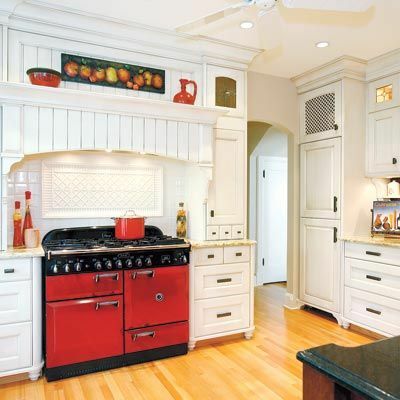 This is where I dream I’m cooking this meal – on this red range. Still, when we sit down to eat, everyone sighs and savors each bite. We actually eat slower because we actually enjoy everything about it. We sit longer, talk longer, laugh longer and our evening spreads out over the course of hours. There’s delight in making this dish and dreaming about time spent together over steaming hot bowls of it. My eldest knew I was making this, but as she so wistfully made her way into the abyss of her bedroom for the next few hours, I was chopping, browning, pouring, stirring and planning out how to get this done before leaving to pick up my middle son from middle school football. Her appearance in the kitchen caught her off guard. Looking around the kitchen filled with dirty pans and the noticing the beginning smells of what would become dinner, she noticed the French bread rising, the stew bubbling in the pot, awaiting its final phase in the hot oven for the next two hours, and the scrubbed potatoes that would eventually be mashed into a delectable fluffiness. “What did we do to deserve this?” my oldest daughter asked. “Absolutely nothing!” I replied. Then we both laughed and squeezed each other tight. Life with a family of six active people doesn’t allow for this kind of meal nightly and not even weekly. I literally prepared our dinner for four hours, interruption free! It was completely undeserved and completely satisfying in every way. I think I said something about hoping God will serve this dish in eternity every day between bites of tender beef mercifully floating in a bacon infused dark gravy. Words just can’t do this justice. Earlier today, I told a friend I had read back over a journal of poured out prayers of lament. It was a little depressing how far back I could go with these pleas, these admissions of sin, how I wanted to change but seemed to be fighting a different battle everyday, although some were the same. I confessed to her that there is much to learn in a season of lament, and the hope I have that even in these times of confusion and wondering, there is still joy and delight in the Lord. There is a trust that He will provide. And as I kneaded, stirred, browned and nearly singed my eyebrows off while pulling crusty French bread from a 450 degree oven, I delighted in the smells of good food filling my house, I delighted in the time around the table that would ensue, I delighted in the God who created it all, the sustenance and the company. He created it all and He delights in me, even when I am grieving, especially then, as well as when my pride-filled heart spews onto pages once white and clean and pure. Here He meets my deepest need to be honest, humble and heard. And what have I done to deserve this? Absolutely nothing! And I smile, undeservingly with delight in all He’s perfectly given me to enjoy. The lament, the grief, the sustenance and the company.